Recently I struggled a lot to integrate solr search with Magento as it is one of the most popular search engine nowadays. Most of the informations are covered here: How to Use the Solr Search Engine With Magento Enterprise Edition . What is the process you have to follow to make solr work with Magento? Grab the solr version compatible with your Magento enterprise edition. Install solr in your system. Start start.jar file available in [solr-installation-folder]/example using command java -jar start.jar . 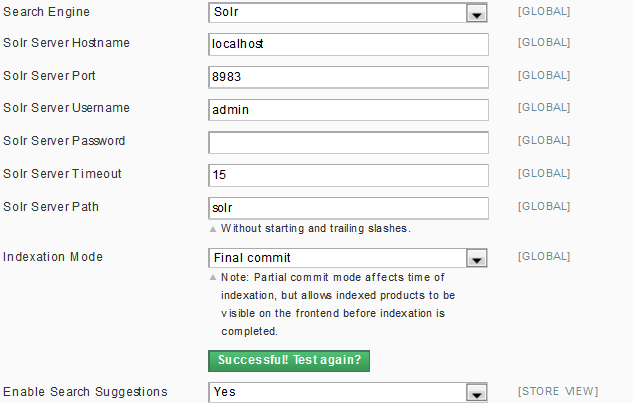 Test solr connection in Magento admin panel. Successful?? Save the configurations and server settings as it is. By default solr runs at port 8983. Now everything is ready. But most of the times you wont be able to see products in your catalog. Why?? Because Solr needs re-indexing of the documents. How to re-index all the documents ? Check the current status of indexing using php indexer.php –status . Here you may see all the index types with current status. Wooha. Solr re-indexing is successful. Now you should be able to see products in your categories and your solr search should be enabled.